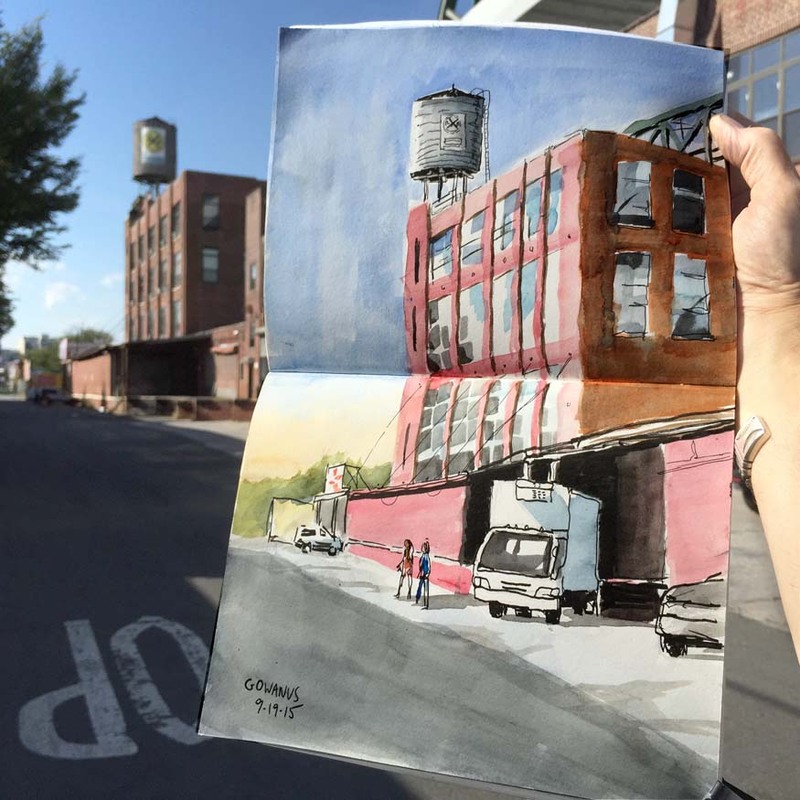 My first Urban Sketching experience was in Gowanus one year ago, and it was a pleasure to join the group again to sketch the same neighborhood and celebrate with friends and a beer. 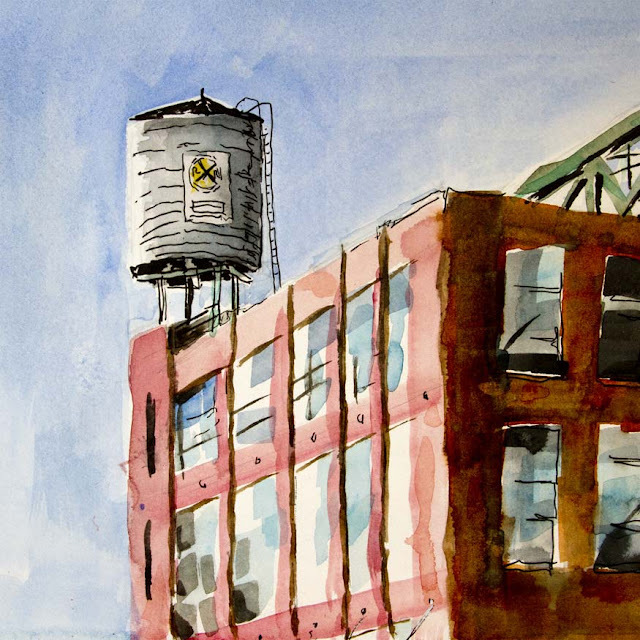 Gowanus, as you may know, is an area in Brooklyn known for its industrial history and polluted and sometimes malodorous waterway. The photo below was taken from the elevated F Train station. 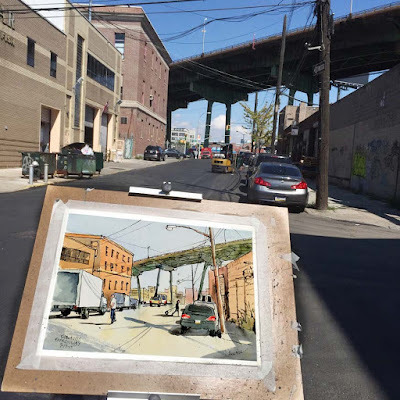 I arrived early and set up my plein air rig on a side street under the Gowanus Expressway and did this painting below. The building to the left is a smoked fish distributor and it really smelled like that. Toward the late afternoon I painted this street which is across from Lowes. 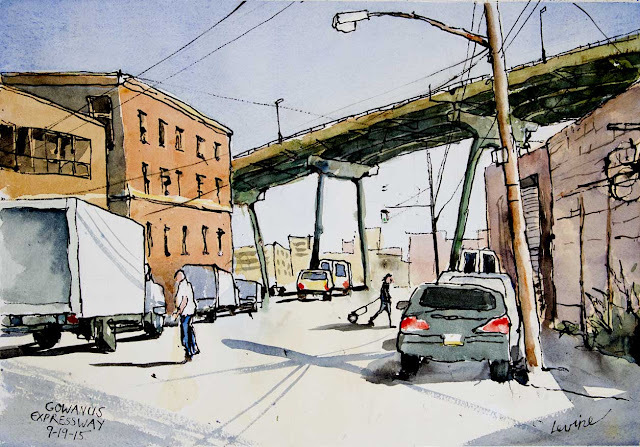 You can see a glimpse of the elevated train on the upper right of the sketch below. Wrapping up our afternoon presentation, Marcy is showing her work for the day. Thats the famous and talented Melanie Reim second from the left. On the way back I stopped off on East Broadway to bring home Chinese food, and took a detour into Seward Park where I had the opportunity to sketch these elders on a bench, one of whom had itchy feet. I look back on my Urban Sketching experience from last year and think my skills have improved. 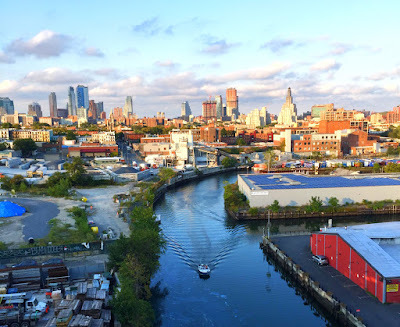 You can compare for yourself by looking at my Gowanus post from one year ago. Thanks Mark for your leadership, and the invitation to join. 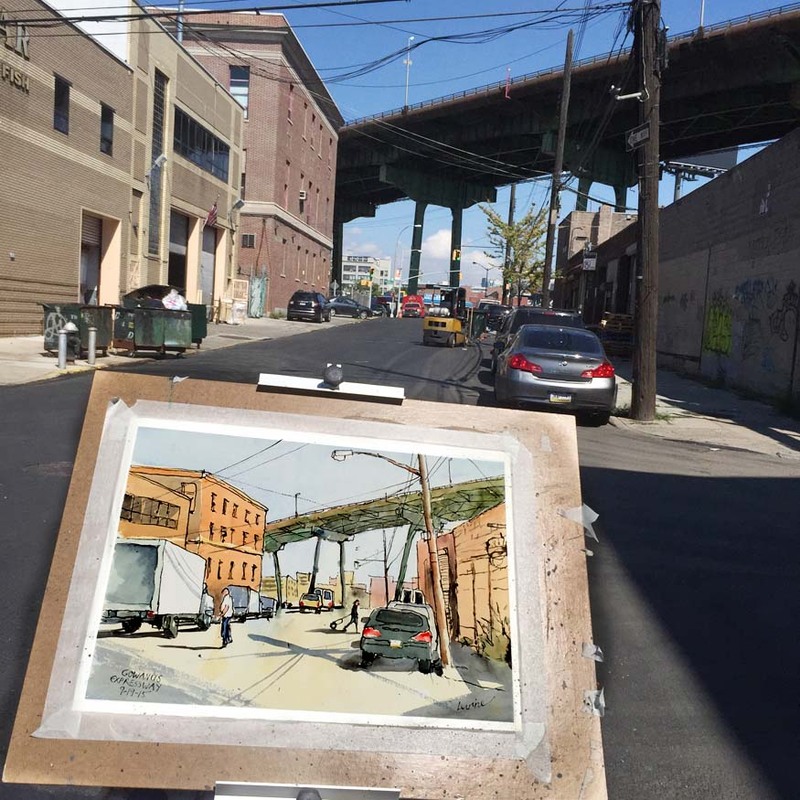 And special thanks to Jessica Dalrymple for helping to arrange the day in conjunction with the Gowanus Canal Conservancy and cooking lunch! 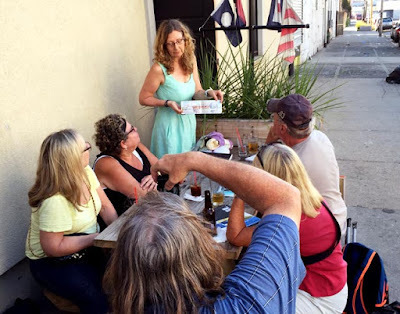 So Sketchers, I look forward to the Fall season, and meeting up again in New York City! 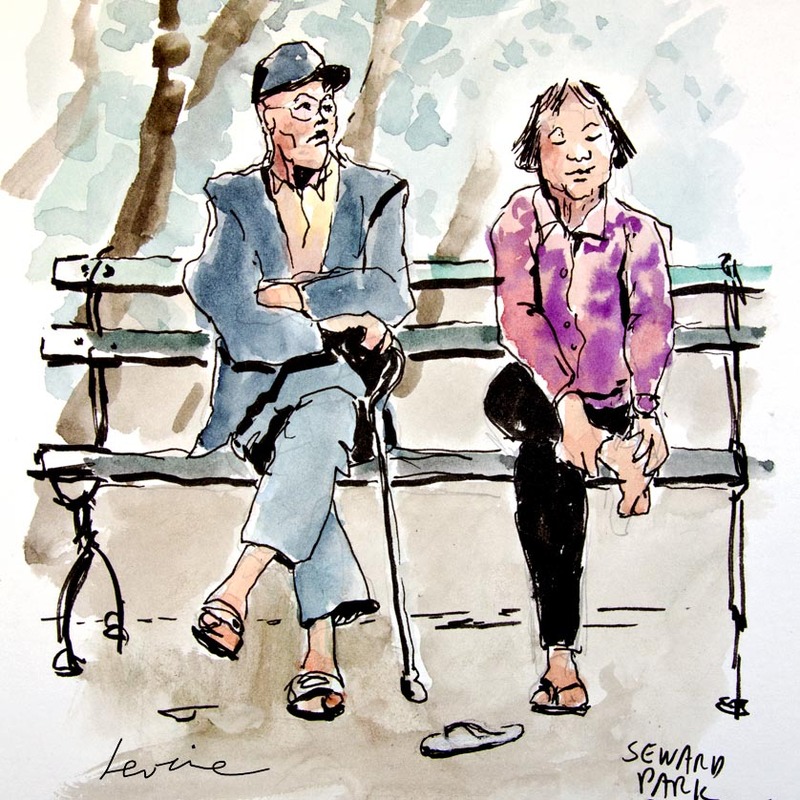 You can also check out my sketches on my Facebook page, or on Instagram @jlevinemd. I have noticed a great improvement in your paintings - especially lately. Your line work, I think, is the magic in them. There is a big difference in your sketches compared to last year...a nice energy! Keep it up, Jeff! Thanks Joan & Pat! I like the word "magic."